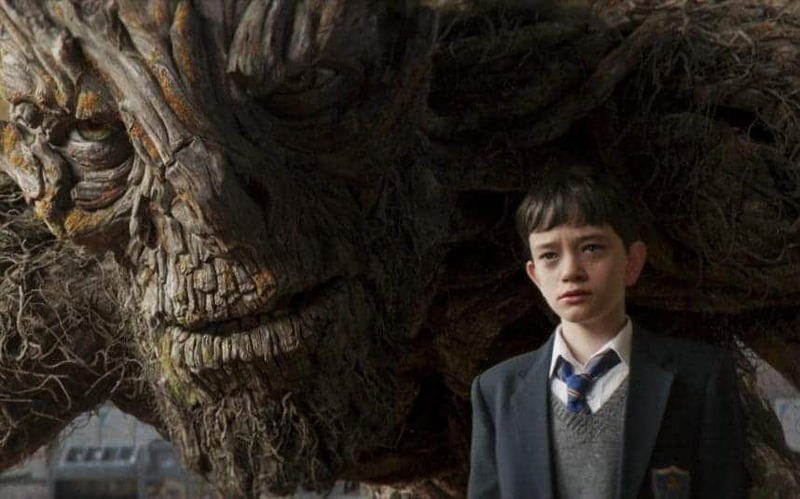 Having seen the film poster countless times on my way to work each day, and seeing the image of the boy next to the large tree-like monster, I couldn’t help but think that A Monster Calls was simply going to be a retelling of The BFG. Yet as the lights dimmed and the film began comparisons to Roald Dahl and other childhood favourites disappeared, as a very different monster awakened. A Monster Calls is the story of twelve-year-old Conor O’Malley, as he attempts to come to terms with his mother’s terminal illness. One night as he draws at his bedroom desk he is visited by a giant monster, voiced by Liam Neeson, that transforms out of a yew tree at the top of a nearby hill. Felicity Jones plays Conor’s cancer ridden mother and Sigourney Weaver is on by as his grandmother, who increasingly becomes responsible for him as his mother’s condition worsens. It is all too easy to sugar coat childhood experiences and forget that for many people it is a difficult time filled with sadness and loss. Some of the challenges faced during this time can be the most difficult we ever face and it is amazing to see a film that takes these issues and this period of our lives seriously, and does not denigrate or patronise its young central figure. Director J.A. Bayona, who has previous brought us The Orphanage and The Impossible, appears to be in total command of proceedings and there is a confidence that accompanies the film. It will come as no surprise that Bayona is a long-time friend of Guillermo del Toro, with A Monster Calls sharing the same dark visual imagery that has come to define much of the Mexican director’s work. The screenplay by Stephen Ness, who wrote the original novel, is also rich in mythology and has a real feel for its stormy and exposed surroundings, making easy to forgive the couple moments of clunky dialogue. A Monster Calls may be set on a children’s novel, but the film adaptation may even be too dark for some of the adults that go to see it. I can imagine this film being the cause of many a child’s haunted dreams and sleepless nights. Traditionally much of the best children’s literature and film contain this darker quality, and Bayona’s project is all the better for it. The watercolour amination of the monster’s world is incredibly effective and holds the same fluidity of dream images. The visuals transition smoothly between the real and monster’s world, and there is a realism to the cinematography and set-design that contrasts beautifully with the colourful amination. Filled with emotional and psychological complexity, the film dives deep into the trauma of childhood with beauty and feeling. Destined to capture the imagination of generations to come, Stephen Ness’ story is a match for the fluctuations of growing up. Rich in gothic mythology, A Monster Calls is the darkest children’s tale I’ve ever seen. A Monster Calls is in cinemas from January 1st. This is a fabulous story! I love it!